Vienna is world-renowned for its pastries, but the city’s culinary offerings don’t end there. From the traditional Naschmarkt to the formal side of Austrian cuisine, here are a few flavors and experiences not to miss while in Vienna. 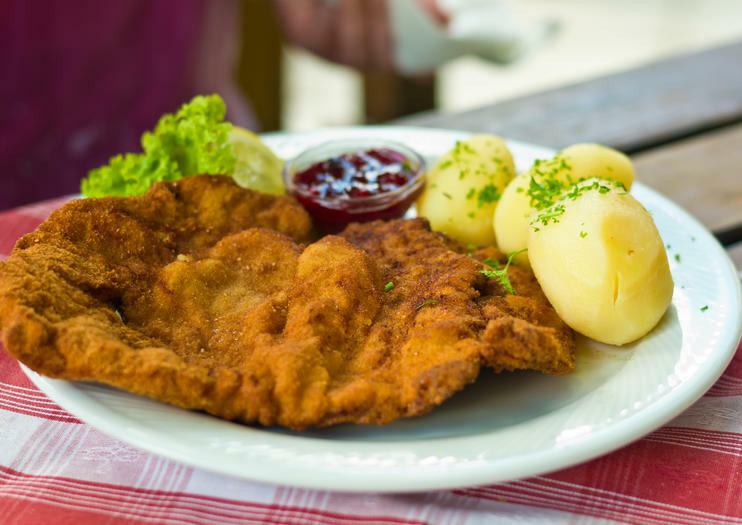 Diners in Vienna should look out for wiener schnitzel (breaded and fried veal cutlet) and tafelspitz (boiled beef in broth). Traditionally served alongside Styrian beans and apple vinaigrette, or thinly sliced with chive sauce, pumpkin seed oil, and green salad, tafelspitz is a firm favorite in fine-dining establishments across Vienna. There’s also a whole host of traditional Austrian cheeses, sausages, and wines to sample. Paying a visit to any busy local wurstelstand (sausage stall) is a great place to start. For visitors with a sweet tooth, the sachertorte—a chocolate cake with a layer of apricot jam and chocolate icing, created in 1832 by pastry chef Franz Sacher—is quite possibly the most famous dessert in Austria. Although there are as many variations on the dessert as there are cafés in Vienna, there’s no mistaking the real deal. Apple strudel is another popular sweet treat, best served alongside whipped cream at the Imperial Bakery Schoenbrunn. And for a true Austrian experience, follow up with a cup of Viennese coffee freshly made by one of the city’s award-winning baristas. Combine a visit to the famous Schonbrunn Palace—considered among the most important historical buildings in Europe—with dinner and an evening classical music or opera concert. Follow a guide through Vienna’s Neubau district to sample chocolate and fresh local street food from the area’s diverse beisls (bistros) and markets. Work up an appetite strolling through the beautiful Karlsplatz and explore the 18th-century baroque St. Charles Church (Karlskirche). Tour the mile-long Naschmarkt open-air market in the bohemian district of Mariahilf. Delve into Vienna’s fabulous coffee scene at a private coffeehouse in Neubau. Spend time browsing stalls of colorful produce, sweet treats, and homewares in bustling Brunnenmarkt. Don’t just shop at the Vienna Naschmarkt, take a tour to make sure you don’t miss out on the best stalls and also learn a bit of history at the same time. Alongside a local guide, you’ll discover the highlights of the fascinating market, chatting with the traders to learn about and sample their specialities. Numbers are limited to just eight people per group, so you’ll have more interaction with your guide through the tour. Explore Vienna’s incredible outdoor market, the Naschmarkt, on a 2-hour tour. Wander the bustling stretch of stalls that showcase a colorful display of exotic produce, rare delicacies and local vegetables and fruits. Follow your local guide from vendor to vendor, sampling the fare, shopping for ingredients and learning the best Austrian recipes to try back at home. Numbers are limited to 10 people on this tour to ensure an intimate experience.